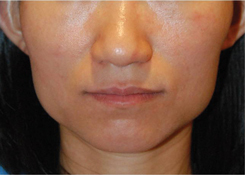 Botox® for Wide, Large Jaws: In the above picture, notice how the Botox® | Dysport® has made the jaws slimmer and more feminine looking for this patient. The injections can be done with little to no discomfort. It requires 2 injections on each side. Botox® for Eleven Lines: The above pictures show the effects of Botox® | Dysport® in the Glabellar Eleven Frown lines in between the eyes. This usually takes 5 shots that can be done with little to no discomfort. 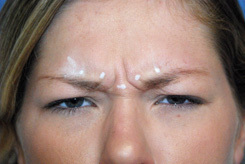 Notice how the wrinkles are much improved with maximal effort to cause the frowning by this patient. 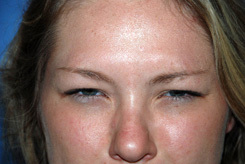 The white dots in the before picture was used to illustrate where we inject the Botox® | Dysport®. 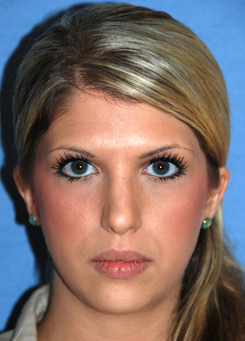 Notice how the area between the eyes are still smooth even with the meanest look that this patient is trying to make! 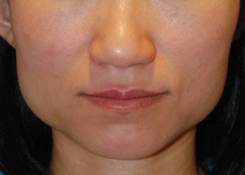 Botox® for Frown Lines: The above pictures also show another patient who had Botox® placed in between the eyes to treat the Glabellar, 11 Frown lines. This is a minimally invasive, low down time method of treating your wrinkles in this area. It also takes about 10 minutes to do. Notice how the frown lines are not prominent even with maximal effort. Botox® Brow Lift: This is the same patient as the one above showing how Botox®, Dysport® can elevate the resting position of the eyebrows. Notice how in the after picture there is a subtle elevation of the brows. The patient looks more awake, less tired, and the eyes look softer. Make that great first impression!